The information on this kale juice recipes page is especially important for women over 45, children, and individuals with family history of osteoporosis, cancer and heart disease, living with high level of stress. 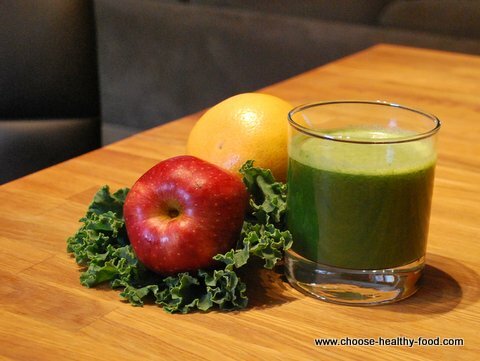 Juicing kale may be an ideal way for you to prevent and revert major health issues. Before you start using these recipes, please invest a couple of minutes of your time in reading this information. Why? To avoid costly mistakes that many people commit when they start juicing kale. To better understand health benefits of kale juice, and what is the best way to derive them. This page contains my best easy and healthy kale juice recipes for you to try, so just scroll down to the recipe directory if you want to skip all this information. Juicing kale is one of the smartest decisions you could make on the path of recovering your health with the whole food plant-based diet. I juice kale because our family cannot always eat as much kale as we are supposed to. We discovered that raw kale juice was a wonderful alternative to taking vitamins and supplements and eating bunches of raw kale. It allows us to get whole food nutrition fast. Our food is also less nutritious than ever because it is grown in deficient soil, stored for a long time, and transported across the globe. So making juice from local kale ( or better from your own - read my thoughts on Growing Kale!) is one giant step in improving your diet. Because even if you cook everything at home, chances are your diet is deficient in those vitamins and minerals that green leafy vegetables provide. In fact, when I entered all my meals consumed in one day into the special program and calculated nutritional content, even my supposedly balanced diet came out deficient. And I am not alone. Many people lack those vitamins that come from green leafy vegetables because that’s the food they eat the least. If you have other questions about juicing kale, you may find answers at my Juicing Kale Q&A page. Besides strong anti-inflammatory effects that help your joints, kale juice strengthens your nails and bones. As an experiment, I was drinking it for 40 days, and my brittle nails with white spots grew strong and healthy. No nail care products could produce the same effect so far. (I used a recipe listed below). Check out this Interview with Brenda Davis, RD: Calcium Rich Foods to see why kale helps fight osteoporosis better than milk. It's important to know if you have little children. Milk is not an ideal way to provide Calcium for them to build stronger bones. Kale juice has much better effect, and provides an overall protection from systemic diseases and obesity to your little ones. Helps to detox your body and boost your immune system. Protects your skin and eyesight. It's especially important for elderly people, as their eyesights starts to deteriorate. It helps to lose weight naturally. Here is my own summary of top health benefits of kale for you. As kale is juiced with other veggies, the benefits of its juice just get better and bigger. Do you feel like a glass of kale juice right now? Let’s start. How to juice with kale? Check out my Juicing Kale Q&A where I answer Top 20 questions about juicing kale, if the list below doesn't answer your question. First of all, mix kale juice with juice of carrots and other fruit and veggies. You don’t have to drink 100% kale juice. In fact, it can be too much of a good thing. If you are not used to it, start with smaller amount. If you are taking blood thinners, beware that your medication may need to be adjusted. Kale contains so much Vitamin K that it can change blood viscosity. This should not stop you from drinking kale juice, you just need to drink the same amount every day and ask your health care provider to adjust medication. This was a priceless advice that I have received from an experienced Toronto Western Hospital nurse whose duty is to monitor blood and diet of outpatients who are on blood thinners. The amount of blood thinners may double for people eating plant-based diet, but it shouldn't deter us from doing it! 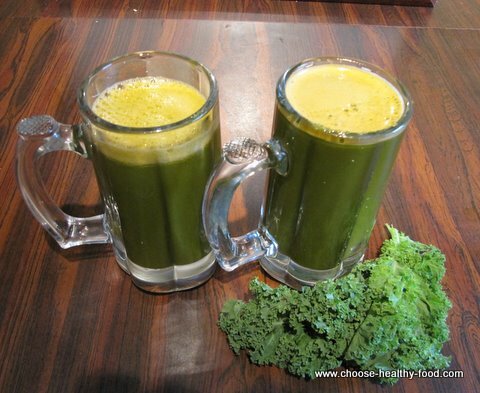 Depending on your juicer, juicing greens like kale may be a challenge. I bought a juicer that is meant to juice greens like kale. After long research I chose an excellent juicer, Omega 8006, that juices kale wonderfully. 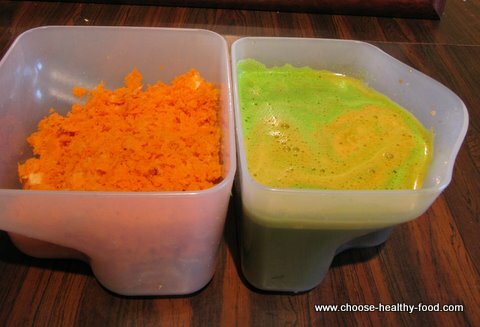 If your juicer doesn’t juice kale well, mix it together with hard veggies like carrots. You will need to alternate carrots, greens, and apples, for example. Use the pulp that comes out of juicer for baking and making bouillon. Carrot pulp and kale leaves (without stems) are excellent in muffins! Anti-inflammatory, good after and during infectious diseases, cold and flu, great for lowering blood pressure and strengthening nails and bones. Detox and weight loss aid. Increase microcirculation, thikness and density of your skin and provide hydration for dry skin with this easy tasty recipe that you will enjoy drinking every day. 3 cups of kale. I use about 5 big leaves; I juice stems, too. 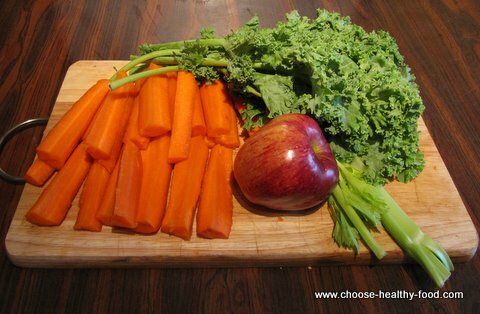 Wash apples, carrots and kale. Cut apples to fit into the juicer. You can use apple heart as well. Alternate pieces of kale, apple, and carrot. Separate carrot pulp and put it into the zip lock bag to use in baking. Freeze kale pulp for homemade bouillon. This amount produces four portions. You can store kale juice in tightly closed jar for one day. Tip: If you take omega-3 supplements, whether fish oil or vegetarian, take them with your kale juice. This will help Vitamin A to absorb much better as it is oil-soluble. Find more on juicing for weight loss on Healthy diet plan page by Alistair Forrest.